QTY 12345678910111213141516171819202122232425262728293031323334353637383940414243444546474849505152535455565758596061626364656667686970 Please select a quantity. This stylish convertible futon sofa goes for a simple yet elegant modern look in your living room. This sofa is upholstered with gray color flannelette with detailed vertical tufting ,glamorous arm design and tapered wooden feet. This futon sofa can easily converted into bed position for accommodating unexpected guests. 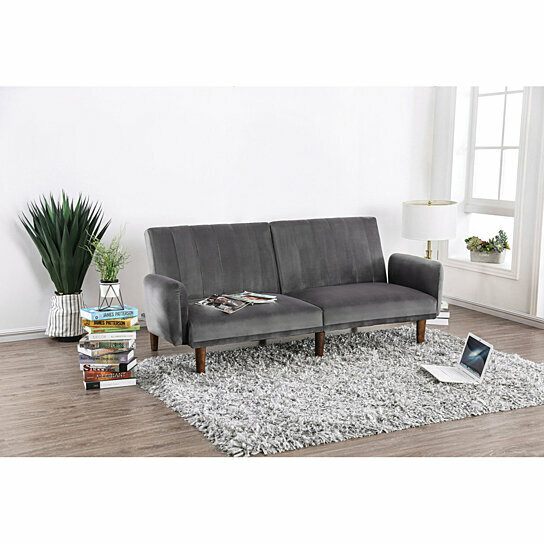 Made up of wood frame over which gray flannelette fabric is draped, this futon sofa is designed with greatest comfort in mind. The unique design inspires a fresh look for your home.